Why buy shade grown coffee? All of Cafe Campesino’s fair trade, organic coffee is grown under a natural canopy of shade trees. Organic certification requires the use of a variety of shade trees on the farm. Shade-grown coffee is coffee grown underneath a canopy of taller trees that provide shade from the sun. Traditionally, coffee has been grown in this manner – underneath a natural forest canopy – and when done so, there are many benefits. However, pressure to increase crop yields has led to some coffee crops being cultivated in reduced shade and/or direct sunlight, which requires increased use of pesticides and non-natural fertilizers. There are several categories of shade-grown coffee, dependent upon the type and amount of shade provided by the shade trees. Rustic: When this method is used, very little of the native plants are removed. It is the least intrusive method of coffee farming, with minimal management and no use of non-natural pest control. Traditional polyculture: This method is based on planting coffee crops and other intentionally-planted crops underneath the native shade trees and other fauna. It involves more alteration and removal of the native plants than the rustic method and provides farmers with both coffee beans to sell and additional crops (fruit, vegetables, medicinal, etc.) that can be used at home or sold at markets. 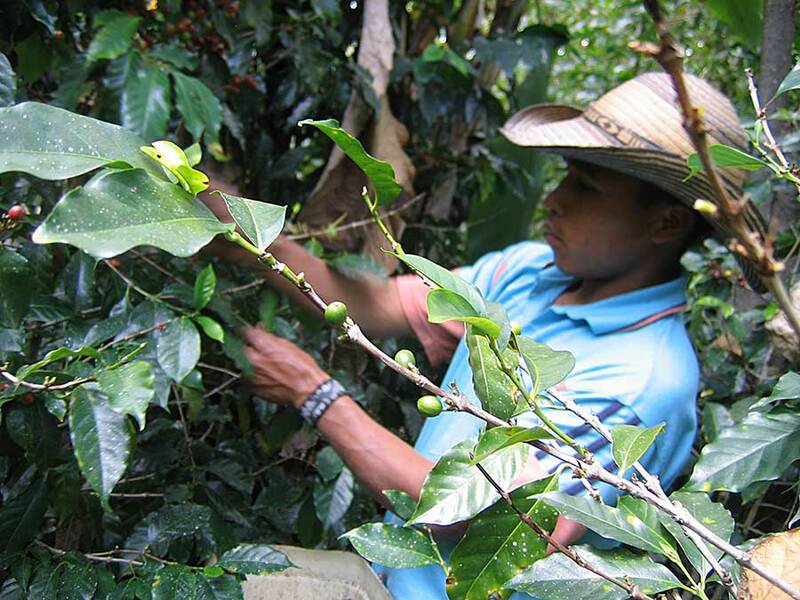 Commercial polyculture: Similar to traditional polyculture in terms of the variety of crops planted (both coffee and other useful plants), commercial polyculture is different in that it involves the removal of foliage to make room for the coffee crops. The shade trees are pruned and epiphytes (harmless organisms that live upon other plants and provide a diverse habitat for other organisms) are removed. This level of shade-grown coffee typically includes some level of fertilizers and pesticides, and the only layers of vegetation are the canopy and the coffee. Shaded monoculture: The coffee crops are planted more densely and managed more closely. There are only one to two species of trees – regularly pruned – that provide shade to the crops. The native plants have mostly been removed in this category to make room for the coffee crops. Unshaded monoculture (full sun): Coffee plants are directly exposed to sunlight – there is no canopy except for a few isolated trees. The plants require high levels of pest control, and the native forest has been destroyed. Because shade coffee is slower to ripen, it often provides a more complex taste and is more flavorful than other coffees. Additionally, shade-grown coffee encourages pollination of both the coffee and other nearby plants. Shade-grown coffee works within the natural ecosystem, contributing to and receiving help from the system. Shade trees provide many nutrients to the coffee plants and the surrounding soil, natural predators help control coffee pests, and the shade trees help protect the coffee crops from frost. Migratory and tropical birds, reptiles, ants, butterflies and a host of other organisms and plant life call the canopy home. This biodiversity has positive impacts on the overall environment, beyond the local canopies where the coffee is grown. The roots of the coffee plants help trap runoff water, keeping the local water supplies clean and pure. Trapping runoff water also helps to prevent erosion. Shade-grown coffee needs irrigation less frequently than sun grown coffee. Shade-grown coffee helps decrease deforestation by leaving the trees standing, which can help preserve atmospheric balance due to carbon sequestration. Coffee & Conservation goes into more detail about shade-grown coffee, including a diagram outlining the different levels of shade typically used on coffee farms, and links to numerous articles detailing the benefits associated with shade-grown coffee. The Smithsonian published a report in 2010 about the ecological benefits of shade-grown coffee.